Overclock.net > Cooling > Cooling Experiments > Best coolant for -40c ? 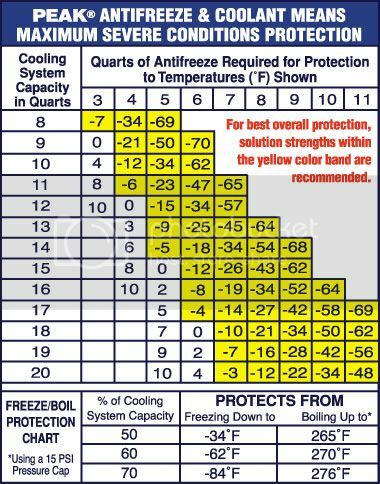 Best coolant for -40c ? I've reverse engineered an R22 dehumidifier for chiller use. Since R22 boils at -41c I am looking for a coolant that can handle that. Not sure if the whole evaporator would get down to -41c but it certainly gets below 0c, since when I run it the water just freezes into an ice block around it. 1. Propylene Glycol: Non-toxic and easy to dispose of. However, I've heard it turns into slush and would basically destroy pumps due to very high viscosity at low temps. Easy to buy as RV Coolant. Not sure on the mix ratio with water they sell though. Non-flammable. 2. Ethylene Glycol: Non-fuming at least, no pets or kids in house that would drink the stuff (toxic). Is this any easier to pump at low temps? Any less viscous/slushy? Very easy/cheap to buy as antifreeze concentrate and can control ratio when mixing with water. Non-flammable. 3. Methanol: Available as windshield washer fluid i.e. Rain-X de-icer. Most of these are only available as max 35% methanol which would go down to -30c or so. However, I've read that it fumes quite badly and is obviously very toxic. I don't think I could seal my reservoir well enough that I could limit the fumes so I've more or less ruled this one out. Flows nicely at low temps, but might damage rubber & plastics. Also flammable. 4. Ethanol: Not sure where to buy this, denatured alcohol looks pricey by the gallon. E85 maybe? Nowhere near as toxic as methanol, I mean, it's basically the booze we drink lol. Probably still evaporates too easily? Also flows well at low temps but could damage plastic/seals, and is flammable. Anyone experienced with using any of these at subzero temps? Leaning towards either ethylene glycol or ethanol. Other suggestions would be welcome too. I can't imagine ethanol being a good idea. E85 eating rubber gaskets and seals in older cars not designed for it is apparently an issue (though I've ran E85 in my old non-flex fuel Silverado for months just fine without ill effect, just going off what the mob mentality seems to suggest) and I can't imagine it being any better in a loop. Propylene/ethylene glycol would be my bet. Most of the temp ranges are off specific mixtures, usually 30/70 or 50/50. Get the non-premix and mix it yourself to the temp range you need and no slush. There are a variety of additives available for coolant. Maybe consider a two component solution to your problem? Just be certain it won't corrode or degrade anything in the loop. Ethanol is nasty nasty stuff notorious for degrading containers and will turn some plastics to mush in short order. Of course everclear is quite good in fruit punch. Haha. Oh pook no... friends don't let friends drive modern GM products..
What about Dex-Cool? Turn my blocks into peanut butter lol. As far as the ethanol, I think plastic in the loop would be limited to tubing (could find an ethanol-compatible type) and the pump itself. I'm not sure if a pump with plastic internals (D5?) could even handle these temps without cracking. The rubber seals on the pump could be an issue. I would probably need a stronger pump for either of the glycols. The 3M Novec I've heard it's hundreds of dollars So far I've got $0 into this, the dehumidifier was a "gift" from the previous owner of my home lol. Probably industrial fluids that only companies can buy and don't get sold to private individuals. Such as the mentioned 3M fluids. There is tons of stuff from companies but they don't want to (by law often) sell it to people, they will only sell it to companies, weird I know as if companies use only robots for work. Yes fluids ain't cheap if you want the good stuff. Once you drop to temps that low then arent glycols starting to get really thick? That would take a very strong pump and possibly a custom made block as the orifices may be too small for the thickening glycols. A car doesnt have a problem because 1. The water pump is belt drive by the engone and 2. The tubing is much bigger than you will find in a computer setup so the thicker fluid would pump much easier. I think the Antifreeze at -40 would burn the pump up. As far as Ethanol mixtures, you can find seals and gaskets that are compatible with Ethanol such as Neoprene, Teflon, Polypropylene, Nitrile, Viton, etc. HERE is a page showing some chemical resistances of certain materials. Edit: What about Acetone? Isnt that used as a Dry Ice medium when DICE OCing? That is what I am concerned with on either of the glycols. Maybe a stronger pump like an Iwaki RD-20 or RD-30 could handle it? I will have to do some more research on the ethanol. Should be okay with copper/nickel waterblocks and the right tubing. Just would need a "safe" pump. Nice OC on that 2700X! The Rain-X contains 35% methanol. I marked a line on it where the top of the fluid is, then took the cap off and let it sit outside. I'm gonna see how badly it evaporates. The RV fluid (unknown percentage of propylene glycol, apparently with a touch of ethanol added) I put in the freezer at 14F to see if it becomes slushy/thick. I looked for a temperature laser thingy but alas, Walmart failed me. Harbor Fright or Home Cheapo may have one in stock. I'd like to check how cold the e-vap actually gets. -41C in theory, but no idea if the entire thing could get 4 gallons of fluid down to that temp. The RV coolant in the freezer at 5F-15F did not get slushy or syrupy at all. So that appears to be the way to go for now at $3 a gallon. Just need an igloo cooler and a temp laser thing to test it on the evap. As a side note, I know the evaporator gets colder than 5F. I pulled the glycol out of the freezer and the bottle frosted much more slowly than the evaporator. Overclock.net - An Overclocking Community > Cooling > Cooling Experiments > Best coolant for -40c ?